A rustic soup, in the spirit of Portuguese Greens Soup, but using watercress as the greens. 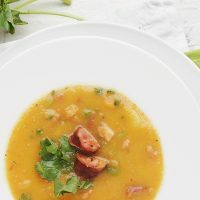 For a spicy soup, seek out hot Chorizo sausage for this one! In a large Dutch oven or soup pot, heat olive oil over medium heat. Add onion and cook, stirring, until it starts to soften. Add garlic and sausage chunks and cook, stirring, until garlic is fragrant, but not browned. Add carrots and potatoes and cook, stirring for a few minutes. Add chicken stock. Bring soup to a boil, then reduce heat to low and simmer 20-30 minutes until carrots and potatoes are tender. Remove sausage chunks to a plate. With an immersion blender or in small batches in a blender, puree the soup slightly, leaving a few small chunks. Taste and season with salt and pepper. Meanwhile, dice the sausage (you can save a few rounds for garnish if you like). Add the diced sausage to the pot and stir to heat. Just before serving, stir in the watercress and allow to wilt slightly and then spoon out soup in to bowls. Garnish with chorizo rounds and a bit of watercress. Notes: To make a smoother, thinner and elegant soup (perfect for appetizer soup), add an extra 1 to 1 1/2 cups of chicken broth to thin. Puree the soup completely, so no chunks are left. Add the chopped watercress to hot soup just before serving. Serve with a spoonful of diced chorizo as garnish.